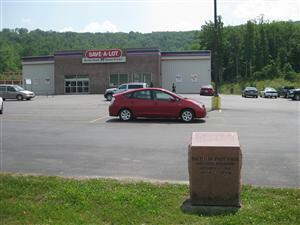 Directions: The Shepherd Mountain historical marker [ Waypoint = N37 36.824 W90 38.239 ] is located in the parking lot of the Save-A-Lot grocery store across Highway 21 from the Shepherd Mountain Inn at 1321 N Highway 21, Ironton, Missouri 63650. From the Ironton Gap Historical Marker, retrace your route back to Highway 21 and turn right to head north on Highway 21. After about 0.6 miles, turn left into the parking lot for the Save-A-Lot grocery store. 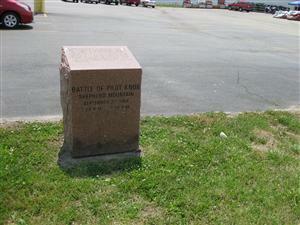 The marker is east of the parking lot near the highway. 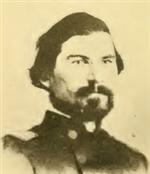 Skirmishes between Clark’s Rebel Brigade and the Union’s 14th Iowa were fought on Shepherd Mountain on the second day. Prior to the assault on Fort Davidson two rebel cannons were placed on the mountain. But because of the accurate fire from Union Artillery in the fort they were ineffectual during the assault on the fort Clark’s Brigade anchored the left wing of the Confederate Army at the base of Shepherd Mountain. "Captain Campbell promptly deployed his battalion into line of battle facing the enemy. As the latter approached in such heavy force we were no match for him. Steadily he pushed us back step by step up the side of the mountain, we, however, maintaining such a rapid fire that the enemy was forced to use caution in rushing upon us. Yet we were steadily and surely driven up the declivity, stubbornly disputing every inch of the ground. The fort lay over the crest, and Campbell kept in mind the fact that it would be only a question of a short time when he would be forced to move rapidly to it for safety." "As the battle waxed hot along the base of the mountain, the guns in the fort began to rake the open space in the pass, notifying us that it was protected; and we felt wonderfully relieved when the shells began shearing the sides of the pass, for it told us that flank was safe … In the meantime General Marmaduke had dismounted a brigade and had sent it through the town of Ironton around our right flank to ascend the mountain and attack us in the rear as we were slowly backing up the declivity. The first intimation I had of troops in our rear was a volley from the rocks and trees above us; before this volley several men fell. I instantly faced my company about [and] … we engaged the force in our rear, which had now become our front." "The crisis was soon reached, with a strong force above us and a solid line ascending the mountain in what was now our rear from the Ironton road. Our desperate position nerved us to drive the force above us back up the mountain, when Captain Campbell skilfully faced us to the right flank and we passed out between the two bodies of the enemy, over the crest of the mountain, and went in all haste to the fort, which we entered from the south ditch." "The army being in front of Ironton, Mo., on the 27th, Fagan's division drove the enemy from that town, forcing him to take refuge behind his fortifications at Pilot Knob. 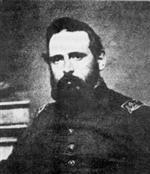 I received orders to occupy Shepherd Mountain with my brigade, which was done without opposition. During all this time, however, volleys of musketry and the roar of artillery gave us notice that a spirited engagement was progressing on our right, the position occupied by Fagan's division. The enemy having taken refuge within a strong redoubt, and showing no disposition to skirmish with us beyond its protection, it was determined to bring the artillery to bear upon the enemy from Shepherd Mountain." "The Confederate artillery … advanced up the slopes of Shepherd's Mountain and in the clear air of that region the picks and shovels of their cannoneers could be distinctly heard as they leveled off a spot for the placing of their guns. While this was being done, I was giving instructions to the men behind the guns under my command. Each gun was numbered, and the order was that I should designate the gun which was to fire and the gun crews not called were to reserve their fire until the number given their gun should be called. 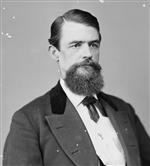 While thus engaged, General Ewing came to where I stood on the parapet of the fort and urged me to open fire on the Confederate artillery that was being posted on the mountain slope. My reply was: 'General, I have assured you that we will hold this fort until night. It is proper that I should defer the bringing on of the battle. My plan is to permit the enemy to fire the first shot, and after that is done there will be firing enough from our side to gratify the desires of everybody. When we open on that mountain, you will notice the advantage that we have and the disadvantage they have, so you will please let me have my own way about it.'"